The word jewellery comes from jewel, from the old French jouel, which in turn comes from the latin jocale, which means ‘plaything’. This piece is made in sterling silver that was hand fabricated from raw materials. I recycled old silver from former pieces and added (14K) green gold accent. I alloy my own metals, and really love the color of gold I am able to achieve with the right combinations of gold, silver and copper. 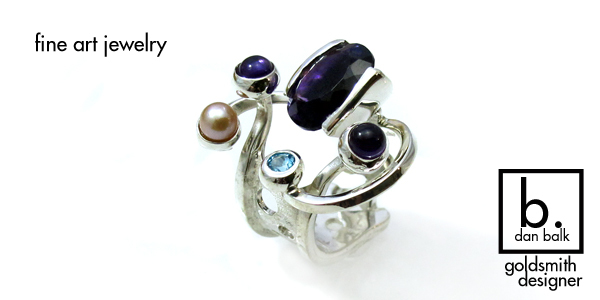 A cobalt druzy, black pearls, a peach button pearl, amethyst and blue topaz are set in this wearable sculpture that I made by hand from design to finished piece from my jewelry studio in Tampa, Florida.